Ruka visits Hayate, Nagi, and Maria at Yukari-chan House, where she has a bowl of udon and reveals her newest advertising job for a sports drink. However, the ad, which shoots on the following day, is to have her on a bicycle, and she doesn’t know how to ride. Hayate says he’ll train her, so they start in the yard with a bicycle on training wheels, where she accidentally trashes Maria’s vegetable garden. 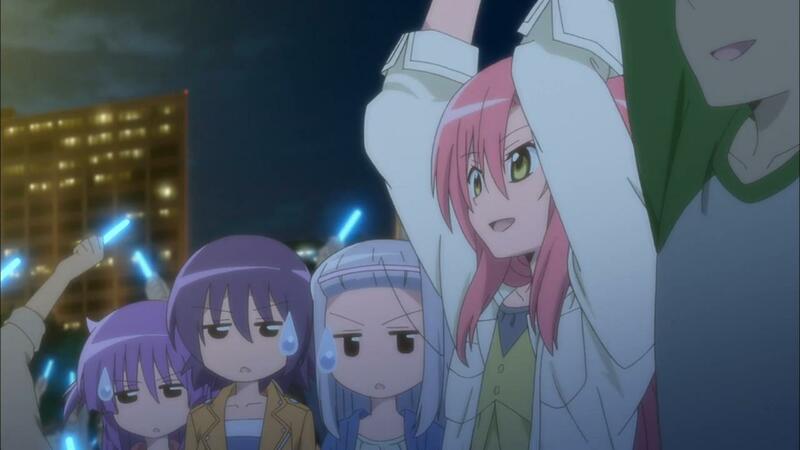 Chiharu comes home so she, Ruka, and Hayate head to the Hakuou campus grounds. There, “Coach” Hayate gives Ruka a choice on easy training or tough training, which would allow Ruka to master tricks. Ruka picks the difficult training and is able to master things as Hayate said, though his training is harsh. 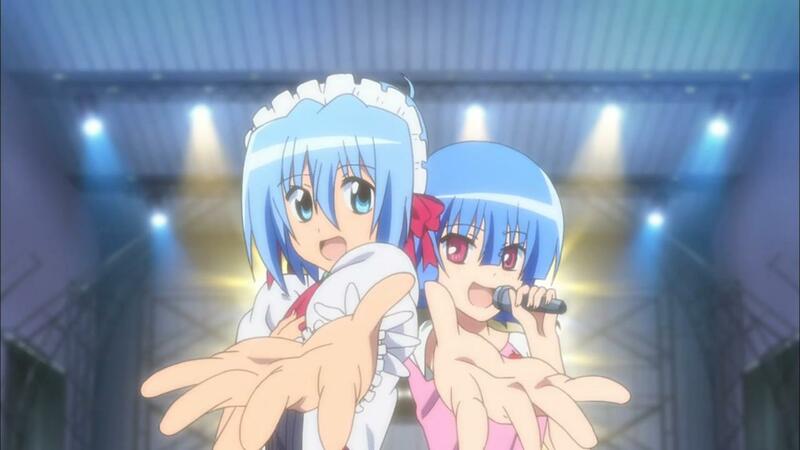 Hayate and Hina have tickets to Ruka’s most recent concert, where Miki, Risa, and Izumi show up to see their rival. 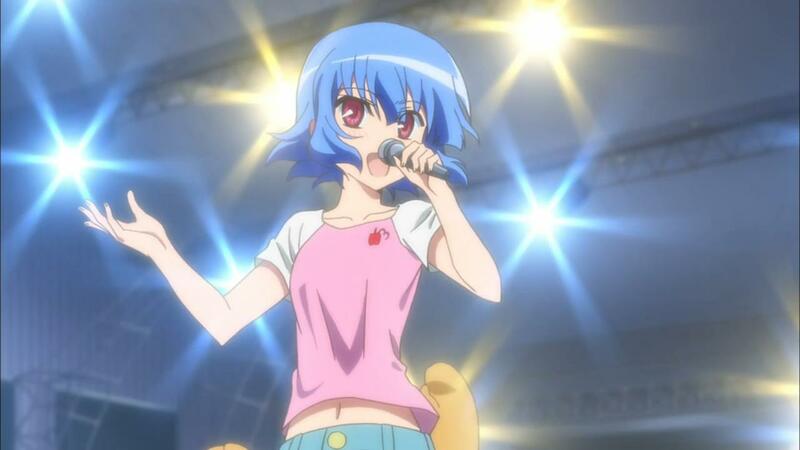 Hayate gets a text from Ruka, so he goes to her dressing room were she and her manager convince Hayate to wear a maid costume and be a backup dancer. Hayate discovers Ruka is injured, which she says came from overdoing it during rehearsals. As such, she needs him to help her change costumes between sets. 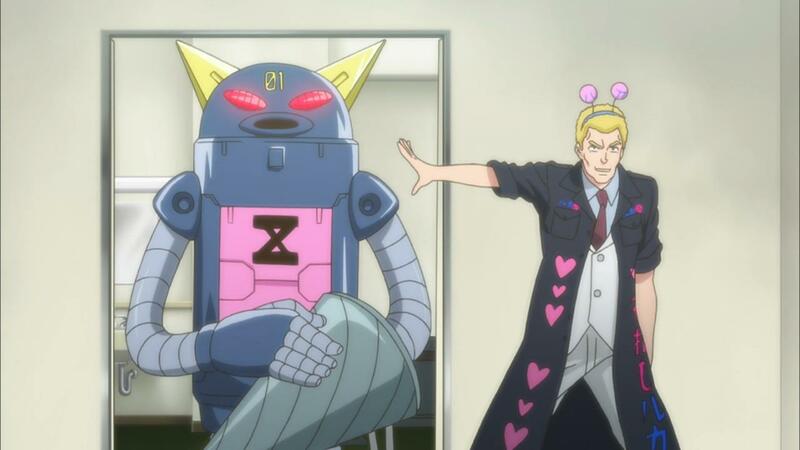 Gilbert shows up backstage, so Hayate punches him. After Gilbert learns this maid-san is Hayate, he produces Idolbuster 961SP, which the staff mistakes as part of Ruka’s act. The robot goes berserk on stage, so Hayate has to defeat it before closing out at Ruka’s side as one of her dancers, pleasing Maria who later watches it on video. For those who care, and no doubt there aren’t many, this episode was adapted from chapters 357 & 358 (volume 33), with elements taken from the first part of chapter 357 as well as elements from chapters 295 to 299 of volume 28. 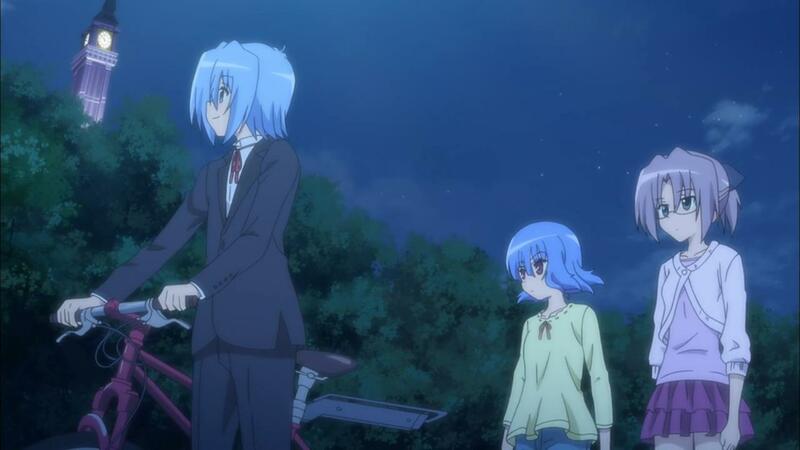 In the original manga, Maria and Nagi weren’t around when Ruka came by to help on learning to ride a bicycle, though the bit with Maria scolding them for trashing her vegetable garden and Nagi’s decision to want Hayate to train her to ride a bike were. In the second story, fairly major modifications had to be made since this Ruka story tied in with the main plot of the manga. 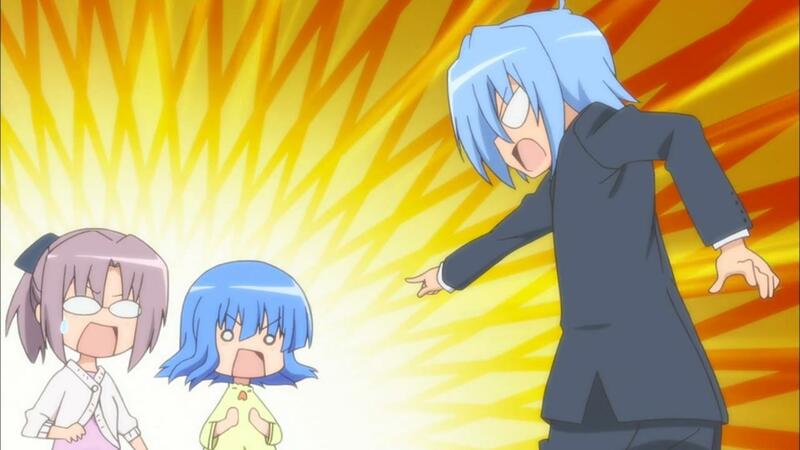 At that point in the manga, Ruka doesn’t yet know that Hayate is a boy, having only seen him in drag. Hayate is wearing the maid costume as part of a doujinshi event so that he could covertly check on Nagi, who’s selling her first doujinshi. Ruka is also there in a mascot costume, as Chiharu is selling her doujinshi. It is here that Ruka gets hurt when the mysterious Yozora (who’s been strangely absent from the manga of late) attacks Hayate with robots. As such, Hayate ends up helping Ruka get to her concert and even protects her when Yozora attacks again with robots, making it seem part of the show Ruka is putting on. Regardless, while I did like seeing the bicycle training story animated, the trashing of the second part was just awful to me. 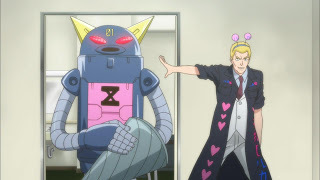 Sure, someone who doesn’t know the manga story but does know the various characters somehow might enjoy it but me, I would have rather this thing been PROPERLY adapted from the manga, rather than this crappy Frankenstein crap that shambles out week after bloody week. Not only that, but the concert was clearly a poor attempt to have Ruka songs played for the otaku in Japan to buy for an outrageous price on CD. 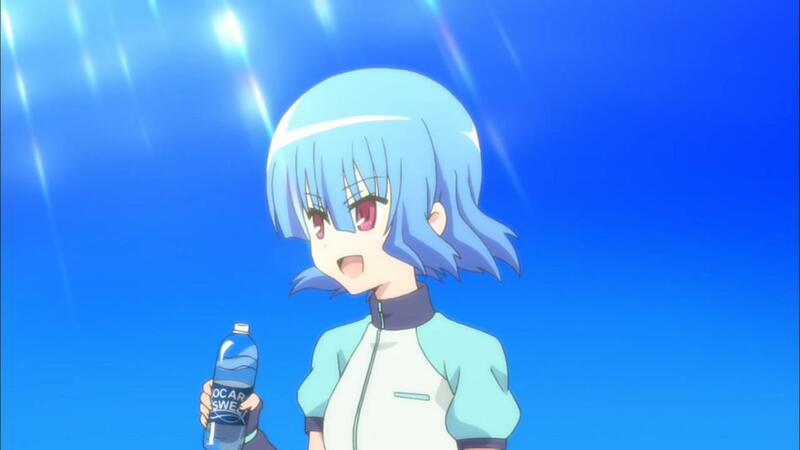 As such, while I’ll finish the anime, I’m finished writing this review other than to say that I did get a smile from the Pocari Sweat parody. At first, what cheesed me off about the second part was mainly that it made Ruka a lot more brazen (i.e. not caring that someone she knows is a guy is seeing her naked)… which is a pretty significant change to her character. 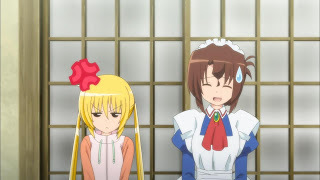 But if you keep pulling the threads on what they did, they managed to junk a good bit of the development of Hayate and Ruka’s relationship, as well as elements that are critical to the current storyline (her mistrust of him after finding out the truth in the bath, which leads to her forgiveness being conditional on his promise, which leads to her calling it in with a proposal, which leads to Nagi realizing on a gut level that the competition is serious business and the rest of the gang deciding to help out, which leads to the current trip). If they were trying to outdo themselves with how badly they can bungle continuity, I think they succeeded.